This post was made in partnership with 90+ Cellars. Recipes and ideas are my own. Here is Southern California, September is a tricky month. While much of the country is starting to get cooler temps and fall into sweater weather, here we get scorching temperatures. Weirdly, if you journey into the mountains, barely an hour away, the apple farms are heavy with fruit ready to be picked; there’s a bit of a disconnect. But that means we can continue to savor summer just a little bit longer and make some cocktail and wine choices that transition between these two seasons nicely. Today we’ve partnered with 90+ Cellars to show you how you can meld a summery, sparkling rosé wine with fresh Autumn apples. It’s what to make when you’ve over-picked at the orchard and bought way too much cider. With a light bubbliness, aromas of berries and rose, and a slight acidity, pairing with sweet, tart apples is a perfect pair. These three dishes we’ve picked out work as part of an appetizer spread, on their own, or even as part of a larger meal, and they all pair very well with this rosé. “Holiday entertaining” might still be a few months away, but we think there’s always a reason to celebrate with a party and this transitional time between months, with a few extra hours of sunlight left in the day, is definitely reason enough for us! Now on to the pairings! An easy and quick appetizer to assemble! On water crackers or bread, layer a piece of cured ham, Manchego cheese, and a dollop of apple jelly. The fattiness of the meat and cheese with the smooth, sweetness of the apple jelly pair are lovely with the small bubbles of the wine. Enjoy this cool treat on its own, or between meals as a palate cleanser. Just don’t forget your wine! 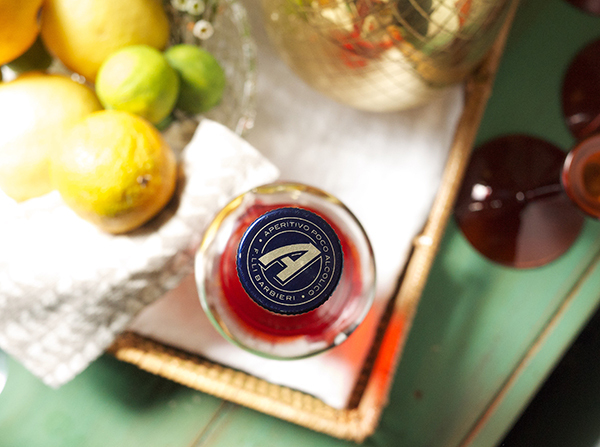 That acidity in the rosé pairs with the slight acidity found in the apple cider and lemon juice in the granita. While a rich, spiced chutney might seem like a heavy match for rosé, the 90+ Cellars Lot 49 Sparkling Rosé lightens the dish up and the spices work really well together. The chutney can be enjoyed on a slice of toasted bread, or alongside a main dish like pork. In a medium sized sauce pan, combine all the ingredients and bring to just under a boil. Remove from heat and whisk to combine. Pour into a 9×12 baking pan and place in the freezer. After 30-45 minutes, whisk mixture to break up any ice chunks. Wait one hour and with a fork, scrape through the mixture so that it is chunky. Wait an additional hour and scrape the fork through again, fluffing up the mixture. Freeze until ready to serve. Heat a small saucepan over medium-high heat. Add oil; swirl to coat. Add shallots; cook 1 minute, stirring constantly. Add apple; cook 3 minutes, stirring frequently. Stir in raisins, mustard seeds, sugar, pepper, cloves, ginger and salt. Add vinegar and 2 tablespoons water; bring to a boil. Cover, reduce heat, and simmer 10 minutes or until apples are tender and most of liquid is absorbed. Serve warm or let cool and transfer to an air-tight container. Refrigerate for up to one week. This post is brought to you by Banfi Wine. Recipes and ideas are my own. Of all the holidays over fall and winter, I’d say that Thanksgiving is the holiday where we drink the most wine. Maybe it’s because we’re matching all that food that is being shoveled down our gullets, or maybe it’s always a thoughtful gift to bring to the party. Inevitably, after the meal, and the dessert, and that second meal at 1am, there are always a few stray bottles that have just a little too much wine left in them to finish off standing over the sink. So what to do? This holiday season I’m going to give you guys a few quick and dirty tips to make entertaining easy for you. First up: leftover wine, because it happens. There’s a pretty easy solution that probably has never crossed your mind: freeze it into ice cubes. Because wine has a low alcohol proof and is made of a higher percentage of water, it will freeze. Now, it will never get a solid as an ice cube, but it will freeze and hold a shape. I would suggest freezing the wine for a full 48 hours before use, and to store in the ice cube trays (I like these big guys). You might want to cover with plastic wrap as well so the wine will not brush off onto other items in your freezer. I used Banfi Wine’s Bell’Agio Rosso Dolce for my ice cubes. This Lambrusco is a sweet red wine that is a perfect match for your holiday table. The sweetness of the wine is a nice addition in ice cube form when mixing up drinks so you won’t need much (or any) added sugar. Instant Sangria: slice up some oranges and apples, add a wine ice cube and give the whole thing a generous splash of sparkling water. Stir and let sit for 5 minutes. Wine spiked cocktails: wine ice cube + liquor (gin, whiskey, rum) + a slice of lemon or orange = tasty. Wine granitas: instead of freezing in an ice cube tray, add the wine to small ramekins (like these), give a good spritz of lemon juice, a scant teaspoon of sugar, mix and freeze. After a few hours give it a stir, then do the same again a few hours later. When frozen to the consistency you desire, take them out and eat right from the ramekin. YUM! Do you have a trick for using leftover wine? Leave your ideas in the comments below! For more information on Banfi wine and the Bell’Agio Rosso Dolce Lambrusco, please visit their site at banfiwines.com! This post is brought to you by Aperol. Ideas are my own. Today’s post is a kind of choose your own adventure. Whether you prefer to stay in an air conditioned home bar, or off under a shady tree on a hot summer day, I’m here to help make sure that wherever you do go, you have a pretty sweet bar set up. 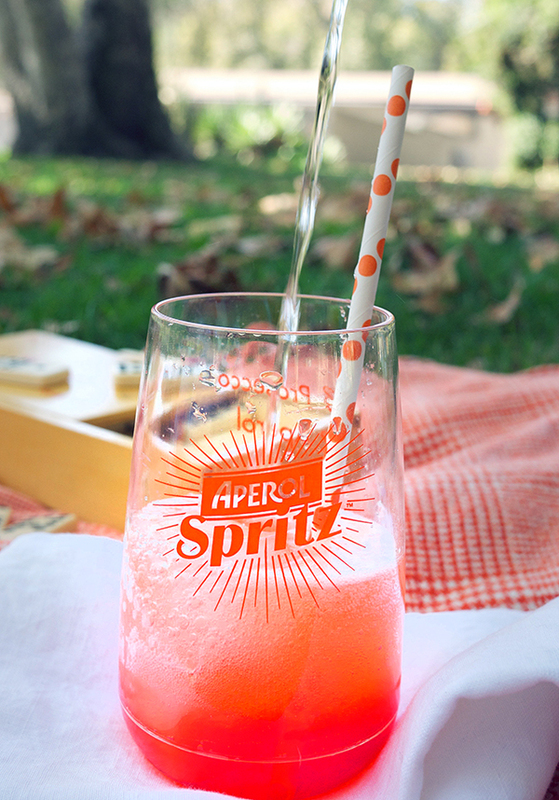 I’ve teamed up with Aperol this summer to help kick off your very own Aperol Spritz Break. What’s that you ask? Italy’s favorite spirit, Aperol, has it’s own signature cocktail that’s the perfect reason to stop and take a moment to relax. 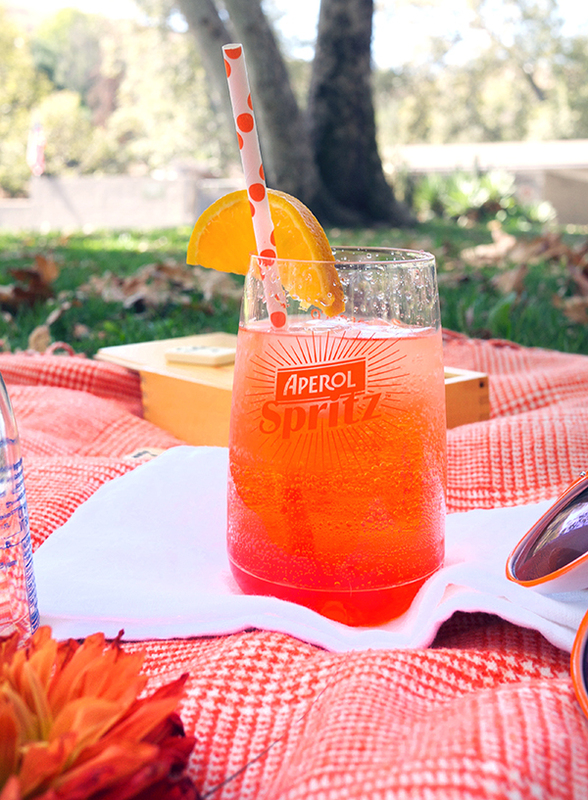 Where you relax is up to you, so let’s get you set up for your #SpritzBreak. Although you may have a serious case of missing out looking at everyone’s Instagram account that shows off their mid-century bar cart, let me tell you that a decent home bar does not require one. I don’t have one, and look, I have a whole website devoted to cocktails made out of a home bar. This set up just requires you have a small rectangle of space to devote to your seasonal drink. A seasonal drink? Yes. Why? Because cluttering up your space with a bunch of bottles is messy and if you have everything picked out ready to go, you look so smart when guests drop in and you can offer them a drink within seconds. It also means you get to switch out the area every season and fill it up with a new recipe and accoutrements; man I love the accoutrements. For the summer I’m enjoying an Aperol Spritz. What makes a great space? The details. Your bar set up should be a tiny party waiting to happen. It should look like fun, but it should also be neat and have everything you need. Like the proper bottles: have all the bottles you need for your seasonal drink ready and full. And then some. I love the small bottles from Q-Club and Fevertree for when I’m having a cocktail or two at home, or if a friend or Christopher is there enjoying one with me. For the larger crowds I use a soda siphon. Special dibs to you if you have a vintage one that works! Ice: invest in a good ice bucket that will keep your ice cool. I like to break out my bronze pineapple when I have guests, but if it’s couple night at the house, I have a rugged OXO insulated bucket that gets the job done. 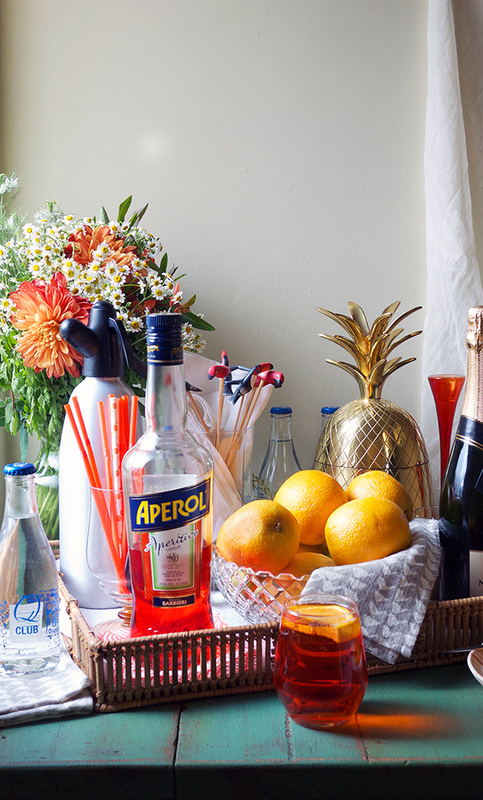 Tools & Glassware: for the Aperol Spritz, no shaker is necessary. Just a stir stick to give it a final swirl before serving. For this punchy-colored cocktail I prefer an equal punchy-colored stirrer. 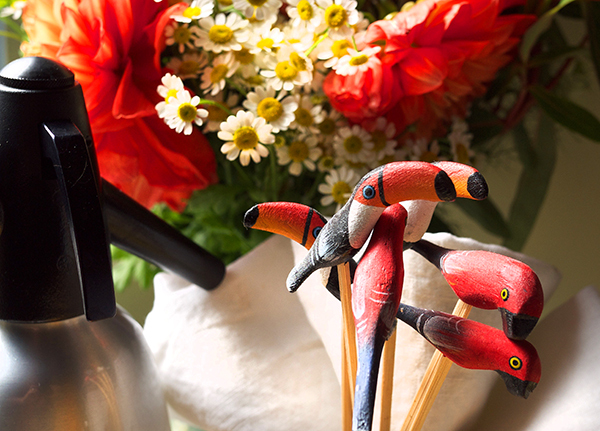 These birds came from South America, but you can just go as far as Amazon and find some colorful ones. For serving, I like to have a few different size glasses available since this recipe is so adaptable. A few stemless wine glasses and some larger goblets for when you’re in the mood. And don’t forget a small knife for your fruit. And speaking of fruit: always have a full bowl of fruit. Always. It’s not like they need to be kept refrigerated, they pretty up the space, and you’ll need lots of orange slices on hand for that Aperol Spritz. Extras: It may seem obvious, but have some napkins for you and your guests. I always have paper and cloth napkins at the ready. You know there are just some people you’ll have over that either need a lot of napkins or are going to destroy your nice hand-stamped linen ones: give them paper. Alternatively, there are going to be some folks who scoff at paper. Whether it’s because of the environment or they’re a whole bunch of haughty hoo-haw: give them the cloth. Chances are they know enough not to spit their gum out in it. This same reasoning goes with straws too. Both napkins and straws are the quickest way to change up the whole theme of your bar area. And lastly, flowers: I’m a glutton for fresh flowers around the house. If I had my way there would be a constant rotation of flowers and my house would always smell amazing. 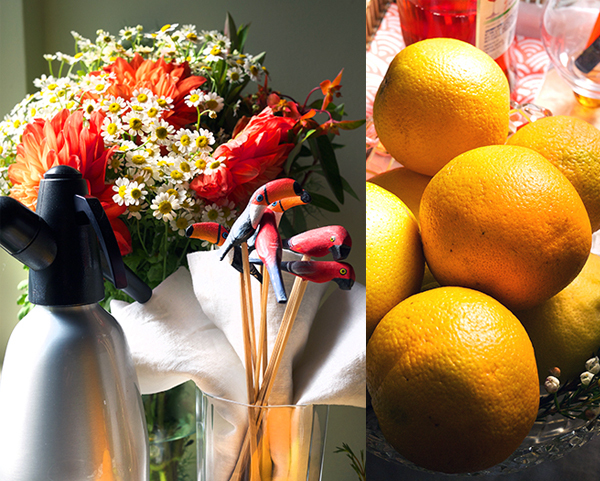 A little bouquet just perks up the bar area and you don’t have to get super fancy. BONUS: get edible flowers and use them in your drinks. Whether you’re moving the party outside to the stoop, out to the park, or over to the beach, sometimes you need to just take it out of the house. 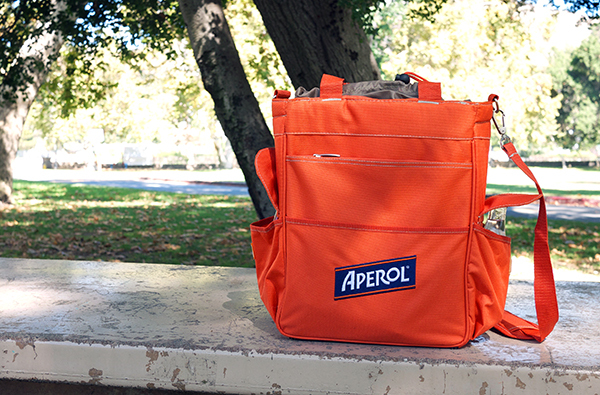 Everything you need to have your own Spritz Break party can easily fit into a small insulated bag like this; just stop and get some ice on the way! Bring only what you need: a bottle of Aperol, a bottle of prosecco, and two small bottles of club soda is enough for you and a small group of friends to have a nice round of drinks. Have the right tools: napkins, straws, a bottle open, a selfie-stick. Only the essentials. Glassware: leave the real glass at home. Invest in some nice quality plastic for trips out. A place to sit: blankets are lovely. Chill your bottles beforehand. That way your ice doesn’t immediately melt as soon as it hits the liquid. Cut your garnishes at home. Then you don’t have to bring a cutting board, a knife, and attract bees (trust me on the bees). Bring along some lazy games like playing cards or dominoes. Or Cards Against Humanity. Something that you only need to give a quarter of your attention to so you really do feel like you’re taking a break. Regardless of where you head this summer, use these tips to make sure you have the best bar set up, and you’re sure to have a relaxing Spritz Break. Add prosecco, Aperol and club soda to a glass filled with ice. There’s really no cap on the size of each part; I’ve been known to fill a goblet or two. 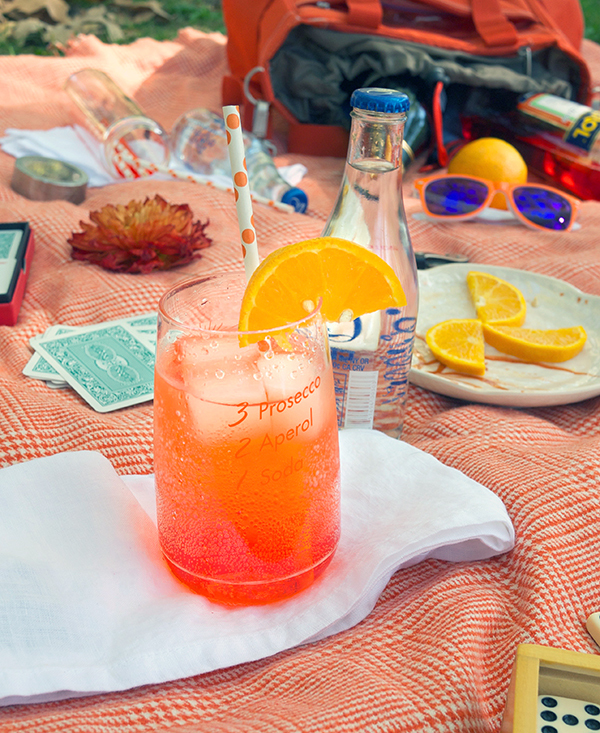 Top your glass off with a slice of orange, maybe a straw or two, and you’re ready for your #SpritzBreak! 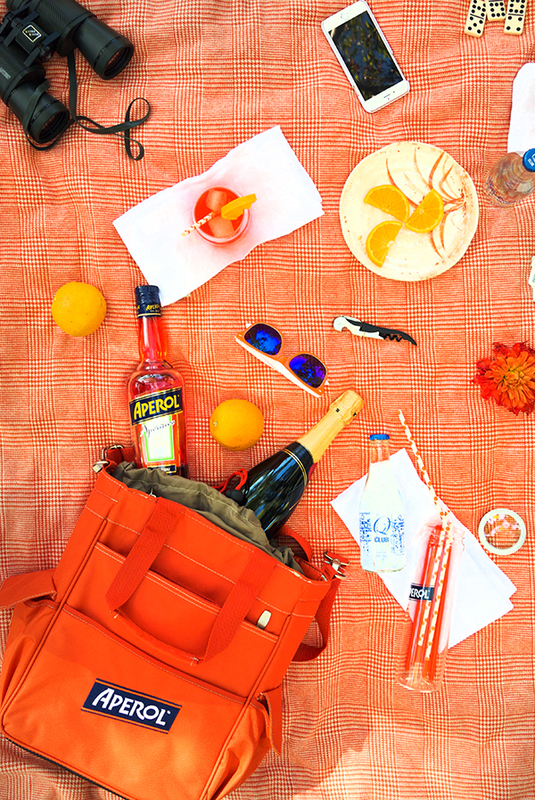 For more Aperol Spritz Break ideas, please head on over to Aperol.com!